The Ossipee Mountains, located in the Lakes Region of New Hampshire, are the remains of an ancient volcano. Much of the range is wooded and has been home to many hiking trails for hundreds of years. Two of the largest property holders in the range include a non-profit organization named Lakes Region Conservation Trust (8,278 acres) and a forest products business named Chocorua Forestlands, LLC (5,372 acres). The United States Forest Legacy Program was established as part of the Food, Agriculture, Conservation, and Trade Act of 1990. On March 22, 2002, 5,372 acres of land in the Ossipees were permanently protected when the USDA Forest Service Forest Legacy gave $1,400,000.00 of Federal tax dollars to Chocorua Forestlands, LLC for the purchase of a conservation easement. The USDA subsequently released this document (Adobe Acrobat .pdf format), detailing the purchase and the protection of a 4.8 snowmobile trail and 6 miles of hiking trails. On March 28, 2002, a Grant of Conservation Easement for the Ossipee Mountains Tract was filed at the Carroll County Registry of Deeds. In section 1 ("Purposes") of page 2 of the document, part D stated "To guarantee pedestrian access by the public for hiking, cross country skiing, hunting, fishing and other low impact pedestrian recreational activities on the property and snowmobile access on the existing snowmobile trail." 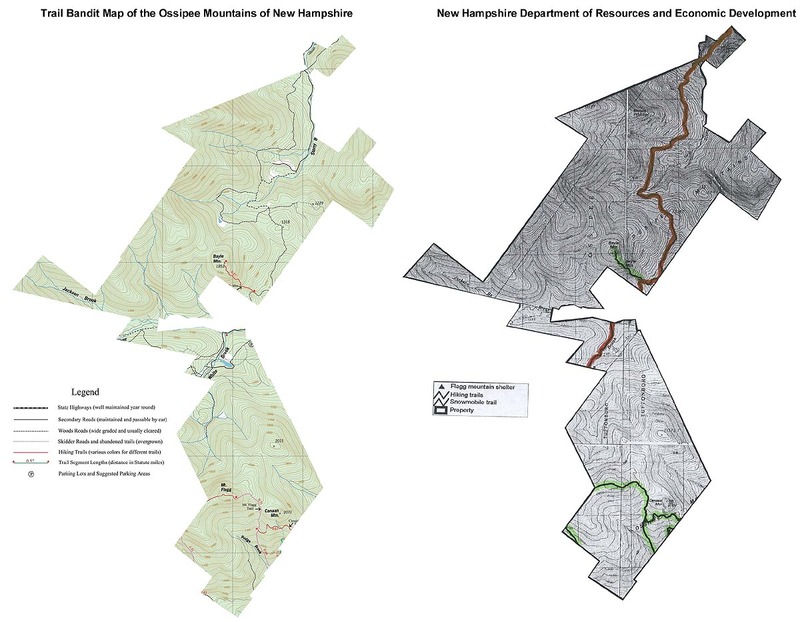 As part of the New Hampshire Forest Legacy Program, applicants (click here to see a copy of the Forest Legacy Program application in Microsoft Word .doc format) agree to "guarantee public access on the property, which will allow the general public to hike, hunt, fish, trap, and participate in other low impact outdoor recreational activities, and snowmobile on designated trails." 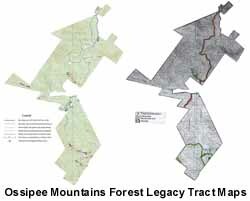 In the summer of 2009, multiple signs were posted in and around the Ossipee Mountains Forest Legacy Tract. At first, signs posted against wheeled vehicles, tools, and horses. In addition, these signs stated that "any maps that do exist that invite the public onto this property are an illegal invasion of private property." 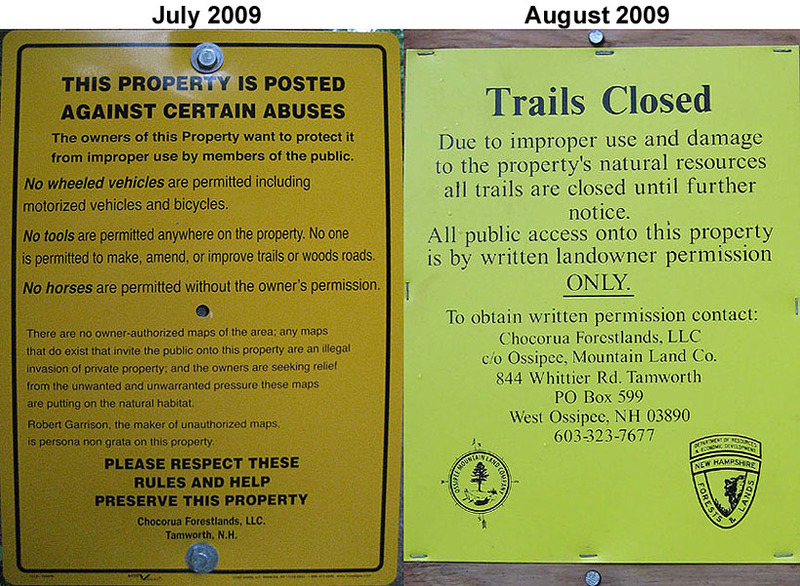 Later in summer 2009, a new series of signs were posted in and around the Ossipee Mountains Forest Legacy Tract, stating that "Due to improper use and damage to the property's natural resources all trails are closed until further notice." 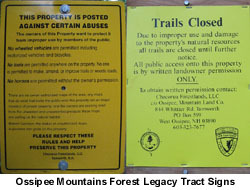 On August 27, 2009, the New Hampshire Bureau of Trails issued a press release stating that "12,000 acres in the Ossipee Mountains region have been closed to public use due to irresponsible trail users. The owners of the Chocorua Forestlands have closed the acres under their control to hiking, bicycling, walking, hunting, and fishing until further notice." The Concord Monitor published an article based upon the press release on August 29th. The article discusses the Trail Bandit Map of the Ossipee Mountains, published in print and made available for free online. According to the article, "The owners of 12,000 acres in the Ossipee Mountains have closed the property to the public after users cleared unauthorized trails, in some areas applying herbicide to the land, and posted a map online identifying the new or modified trails." Chocorua Forestlands, LLC President Jeff Coombs is indirectly quoted in the article: "Whole trees and limbs were cut and dragged into the woods. A half-mile of trail about 12 feet wide was treated with herbicide, he said. Seventeen new campfire rings were found on the property." 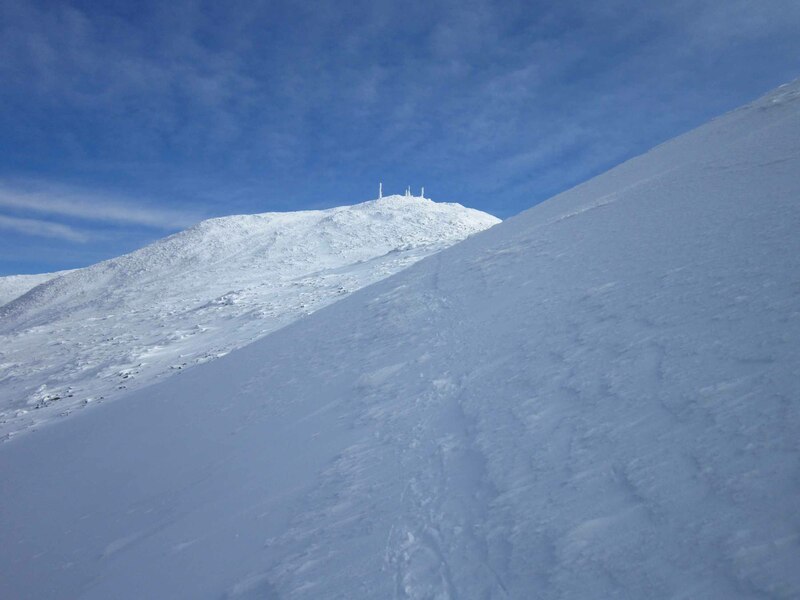 The New Hampshire Bureau of Trails Chief Chris Gamache is quoted in the August 27th press release as saying, "We support the landowner�s decision in this matter and will work with them to get public access granted back on these properties." 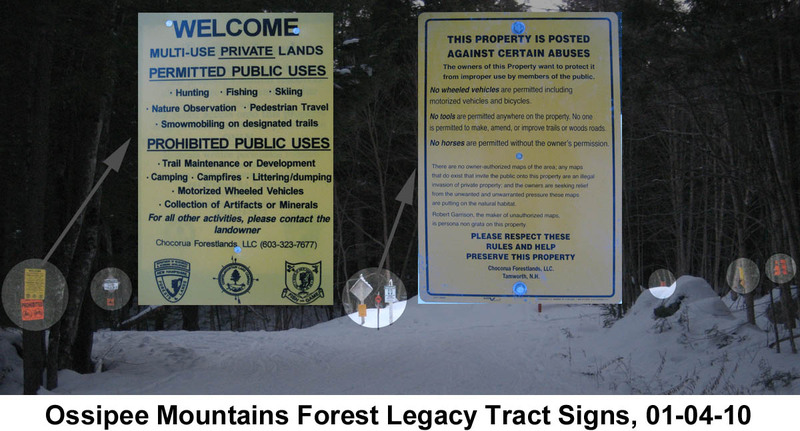 According to Gamache, anyone caught trespassing on the Federal taxpayer preserved Ossipee Mountains Forest Legacy Tract could be charged with a misdemeanor. 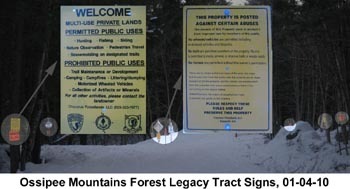 On December 3, 2009, the New Hampshire Bureau of Trails issued a press release stating that "signs advising that written landowner permission was required for access are being replaced with new signs to better educate the public. These signs will explain which type of activities may occur on the properties without landowner permission and those activities that require landowner permission." As of spring 2010, public access points are littered with dozens of signs detailing restrictions of use. Long established trails (specifically protected with the $1,400,000 in tax dollars) appear to be falling into disrepair. In spring 2010, an anonymous blog surfaced with photos of environmental damage in the Ossipee Mountains Forest Legacy Tract. In fall 2011, the Trail Bandit launched a new web site, which included a page called My Take on the Ossipee Mountains, detailing logging company connections and photos of environmental damage. On May 5, 2015, a large forest fire broke out in the area of Bayle Mountain. In the days that followed, more than 130 acres burned before firefighters were able to contain the blaze. The area, located within the Forest Legacy Tract, had been heavily logged in recent years. According to a firefighter interviewed by WMUR, logging slash was a problem. Copyright 2002-2017, All Rights Reserved.